中国・北京見聞記①　なぜ往復の時間が違うのか？China records (1) - What causes the flight time differences? 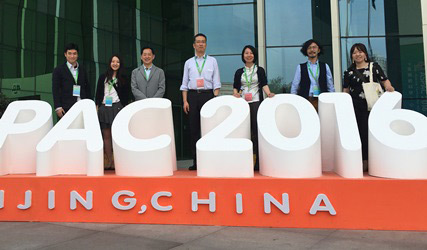 We, science communicators, K, Chen, and me visited Beijing to attend the annual ASPAC (Asia Pacific Network of Science & Technology Centres) conference from 18th to 20th May. Let me share my experiences in Beijing. Today is "Flight mystery" from Tokyo to Beijing. 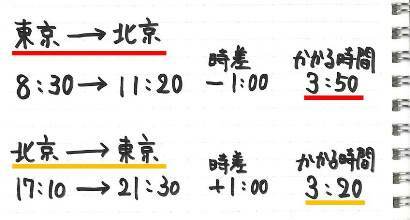 Flight times are different between "from Tokyo" (2h 50m) and "to Tokyo" (4h 20m). Masa:"What causes the difference?" I wondered. I discovered one answer when I arrived at Beijing. The departure time and arrival time on the schedule was the "local time". We must take into account the "time difference" (1h) to calculate exact flight time! Masa:"OK, the time difference caused the mystery. 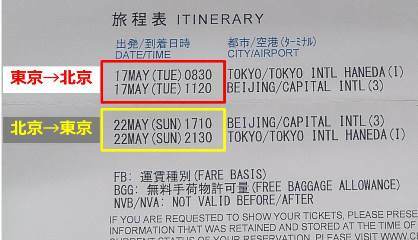 Let's check the exact flight time..."
Compared to going to Beijing, it takes 30 minutes less when I return to Tokyo. Staying time around airports? No. I found the answer on the JAPAN AIRLINES website. 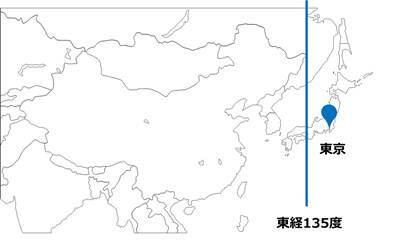 On the mid-latitude including Tokyo and Beijing, there is the strong wind called "Westerlies". The speed of westerlies is 360km/h, faster than one third of airplane (800-900km/h). International flights often fly at an altitude of 10,000 m, the same altitude of westerlies. That means westerlies are headwinds for flights from Tokyo to Beijing, and tailwinds from Beijing to Tokyo. It causes 30 minutes difference depending on the seasons and the locations of the westerlies. The mystery was caused by the "time difference" and "westerlies". By the way, I discovered a surprising fact when I checked the time zone and standard times. 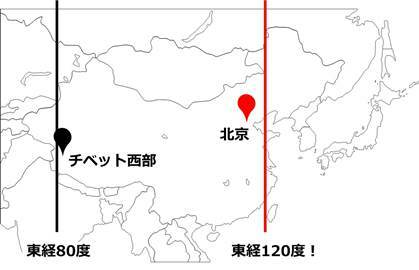 Japanese standard time is based on 135 degree of east longitude, a little west from the center of Japan islans. On the other hand, Chinese standard time is based on 120 degree of east longitude. 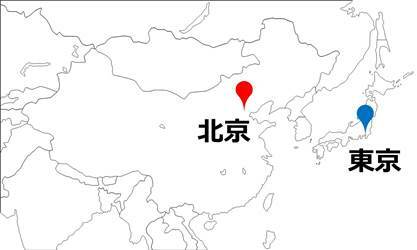 Can you guess where the "120 degree line" on a Chinese map below? Where is the "120 degree line"? The line is on the east edge of China! In the western area of China, the sun rises much later than we imagine, and sets much later. Aki, my colleague who likes overseas trips, told me the story below. He visited western Tibet, close to India and Pakistan, in his schooldays. It was the Autumnal Equinox Day, one half day is night, and the other half is day. On that day, the sun didn't set till 8 p.m. and didn't rise till 8 a.m. Western Tibet is located on 80 degrees east longitude, 40 degrees more western than standard time line. This gap caused the phenomenon. I recommend you to "feel" the size of globe by focusing on "time differences" and "westerlies". Next, I'll compare the Japanese and Chinese cultures, especially traffic. I discover many differences. I hope you to read my next blog! This is nice. I always thought our timeline is based on the local time of Beijing. In oral Chinese, we call it Beijing Time. Maybe we should refer to it as China Time. Anyway, look forward to your next article. 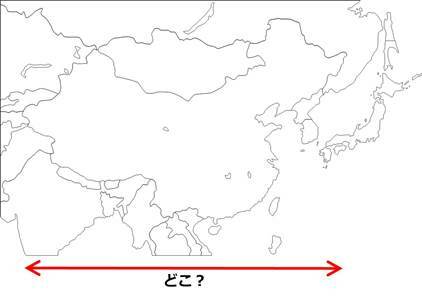 I was surprised when I found timeline is based on "Beijing Time". I learned each country has each background about timeline. Hope to check other cases in huge countries like U.S. and Russia.